Summer ingredients are perfect for light salads that are just right for the season’s hot afternoons. Fresh corn and blueberries pair especially well together, lending a slight sweetness and a taste that reminds me of childhood summers in South Georgia. 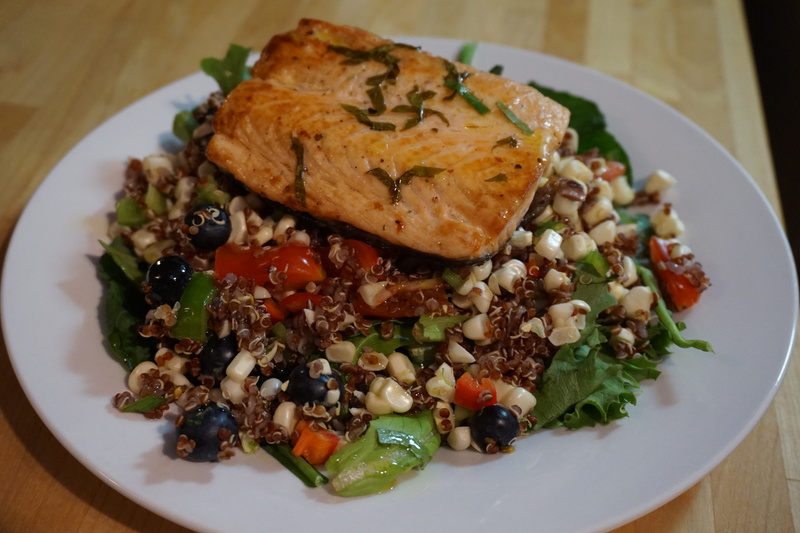 This summer salad builds on this flavor combination and incorporated quinoa and salmon to make the salad a satisfying main course. Preheat an oven to 350 degrees. Cook a cup of quinoa according to the package directions. If buying bulk, add one cup of rinsed quinoa to two cups of water. Bring the water to a boil and turn the heat to low. Let the quinoa simmer for 15 minutes, then drain any remaining water. Once the quinoa is cooked, set aside to cool for 5 minutes. While the quinoa cooks and cools, cut the kernels off of the cobs of both ears of corn. Toss the kernels of corn with the blueberries. Mix in the Cubanelle, sweet red peppers, and tomatoes. Mix in the quinoa and set aside. Season to taste with salt and pepper (about 1/8 teaspoon each). To make a compound butter for the salmon, mix the butter, juice of half of a lime, and two teaspoons of chopped fresh culantro. Put the butter mixture into the refrigerator to cool. While the butter mixture refrigerates, make a simple vinaigrette for the salad. In a small bowl, add the juice of the remaining lime and a half , the Dijon mustard, a tablespoon of chopped culantro, salt and pepper (about 1/8 teaspoon each). Whisk in 1/4 cup of olive oil. 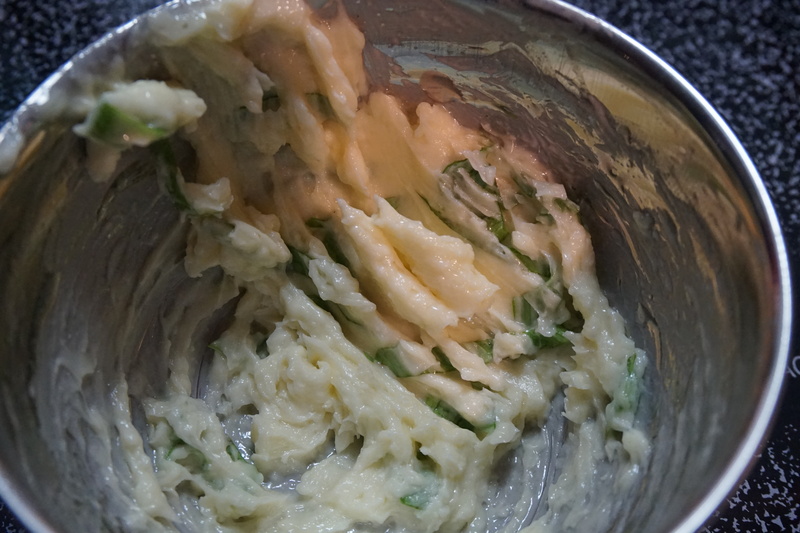 When the vinaigrette is ready, set aside and get the compound butter out of the refrigerator. Spread the compound butter evenly over the non-skin side of the salmon. Heat 2 teaspoons of olive oil in a skillet over medium high heat. Add the salmon to the skillet, skin side down. Cook the salmon in the skillet for 3 minutes per side. 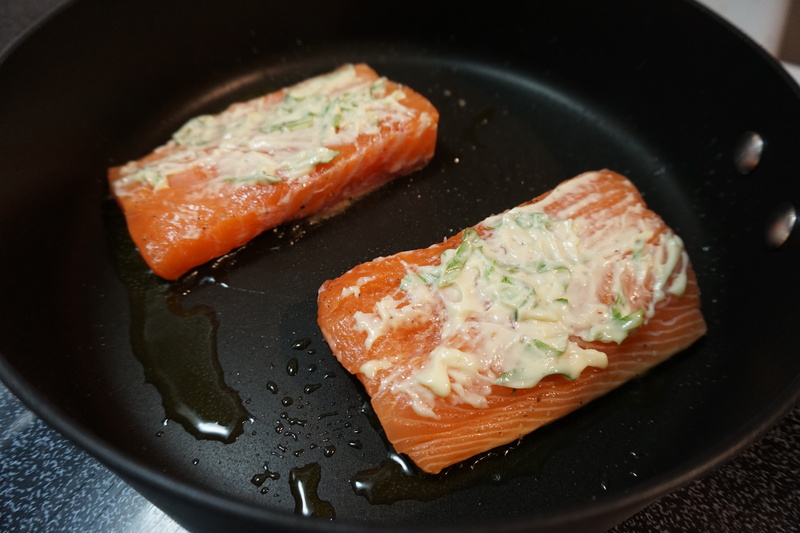 Put a lid on the skillet and finish the salmon in the over for 10 minutes, or until cooked to the desired temperature. 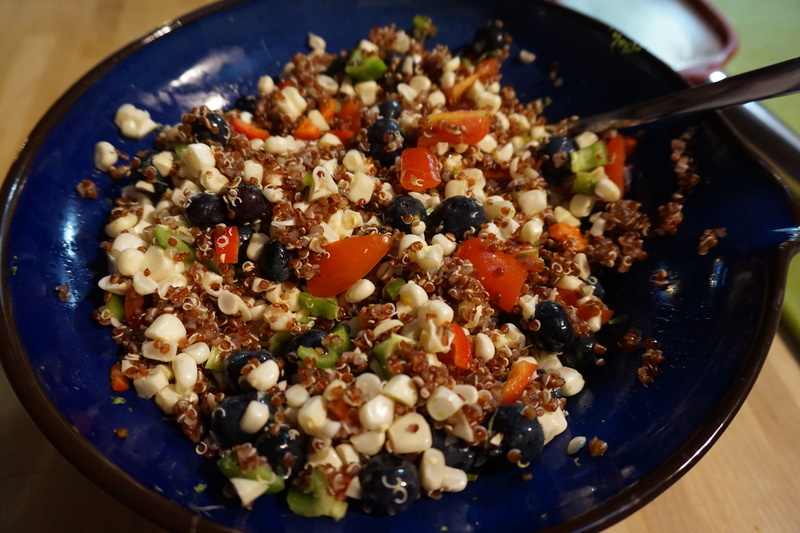 Serve the blueberry-corn-quinoa mixture over mixed salad greens and drizzle with the vinaigrette. 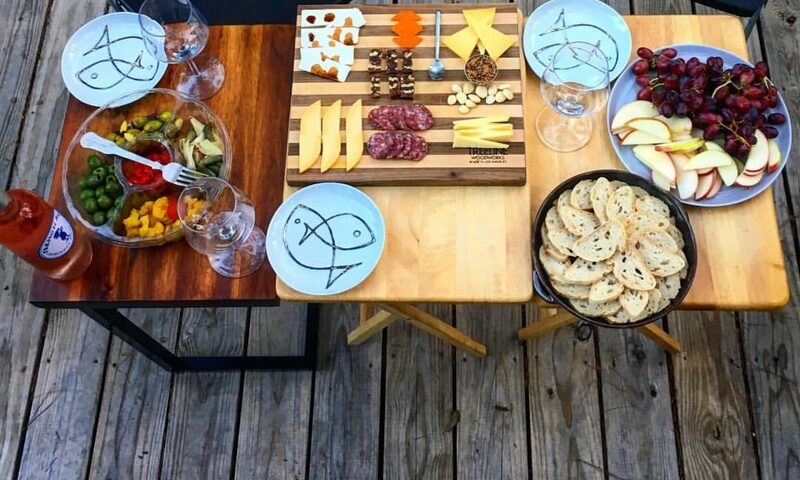 Top with salmon and serve.